streamlines the funding process for the entrepreneur. Syndicates are two or more private investors working together to share the risks and rewards of investing in private companies. Syndicates differ from individual business angel investors, as syndicates are typically comprised of a ‘fixed’ group of people who regularly invest together over a period of time, building trust and leveraging experience. Business angel syndicates are groups of like-minded investors that invest in a specific region or sector that is of interest to them. They are high net worth individuals who provide smaller amounts of finance (typically in the range €25/£40k to €250/£200k) at an earlier stage than many venture capital funds are able to invest. 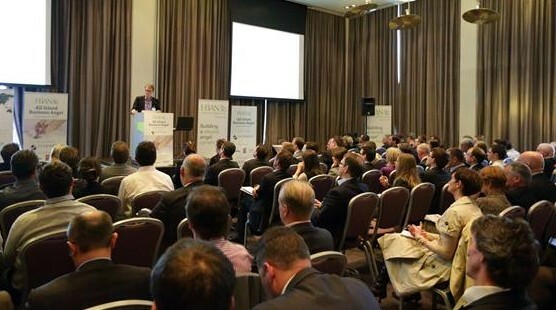 In Ireland and Northern Ireland business angel syndicates are growing in number and capacity to invest. Syndicates will typically co-invest with seed venture capital funds, government agencies like Enterprise Ireland and other private investors. HBAN works regionally in partnership with the Irish Business Innovation Centres (BICs) in Dublin, Cork, Waterford, and Galway and Clarendon Fund Managers in Northern Ireland, who each run local angel networks. HBAN introduces suitable investors to each other and to entrepreneurs. HBAN takes no part in any investment, nor does it provide information to entrepreneurs or investors in relation to particular investments. HBAN does not receive any fee, commission or payment from investors or entrepreneurs in respect of completed investments. HBAN does not provide investment services under the European Communities (Markets in Financial Instruments) Regulations 2007 and is not an investment advisory firm pursuant to the Investment Intermediaries Act 1995 as amended. With the support of HBAN and other deal leads, will you occasionally be able to lead a deal to completion on behalf of the syndicate? Are you willing to learn from other more experienced angels? If you are interested in forming or joining an existing syndicate, HBAN can connect you with active angel investors with similar investment interests. Submit a membership application or contact the HBAN team. Meet our syndicates here.